Pawleys Island South Carolina is our specialty. Our team is committed to making the buying and selling of condos in Pawleys Island, SC a pleasurable and rewarding experience. 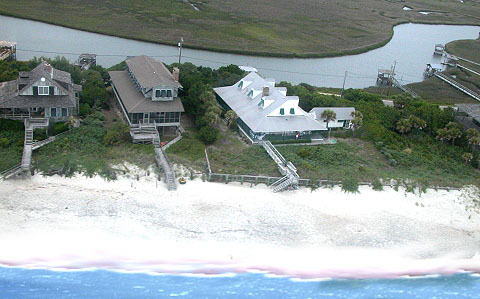 Our website allows you to search all active Pawleys Island condominiums for sale. It is easy to use and navigate through condo searches. You can also save searches and get daily email alerts of new listings as they become available. Pawley's Island is a small but well-established beach community located in coastal South Carolina, about 70 miles north of Charleston and 20 or so miles south of Myrtle Beach. With only 200 year-round residents, but thousands of part-time residents and tourists, this relaxed resort area is often described - with great pride - as "arrogantly shabby" by its laid-back inhabitants. It's known to be one of the oldest and most popular summer resorts on the East Coast. Not bad for a small, non-commercial island that is only four miles long and a quarter of a mile wide! Many visitors say their blood pressure goes down as they cross one of the two causeways from the mainland going on to the island. It's a feeling that keeps many people coming back year after year. Things to do and amusements on the island are practically unlimited: golfing, fishing, crabbing, biking, sailing, nature trips, historic tours, shell gathering, surfing, canoeing, kayaking, beachcombing and river cruises. There are many good restaurants serving local catch and a variety of close-in stores that offer a complete stock of items a traveler or resident might need. The beach is mostly private and very pristine and renowned for it's great surf. Within five miles there are approximately ten first-rate golf courses and a large tennis complex. There's plenty to do and the general feeling on the island is don't hurry and don't worry. Pawleys Island real estate varies greatly. There are both condos and houses offering great views. Some are new and modern. Some are not-so-new, simple and rustic. In the true spirit of Pawley's each has its own charm and amenities. Many beach homes are available to rent all year long. Summer is not the only time to enjoy Pawley's Island. Fall and Spring are magnificent and offer uncrowded beaches, great fishing and spectacular natural beauty.